Uni-span Australia delivers comprehensive scaffolding solutions for construction and demolition projects nationwide. With over 40 years of experience, our skilled engineers, designers and industry professionals deliver safe, effective and innovative scaffold products and services to commercial and industrial sites. Uni-span Australia’s expert team provide solutions and service excellence to our customers by offering professional project planning, design, estimating and supply services. Our highly experienced project managers are capable of managing complex and unconventional scaffolding projects. Uni-span excels in designing simple and innovative solutions to overcome challenging and elaborate construction and demolition projects. Uni-span Australia hires and sells Quickstage scaffolding systems, compatible for all commercial and industrial projects throughout Australia. It is fully compliant with AS1576. Uni-span Australia is ISO 9001:2015, OHSAS 18001:2007 and ISO 14001:2015 accredited, meeting all relevant Australian Standards and codes. Our range includes our patented containment system, Uni-mesh™, LVL scaffold boards, tubing and stair systems for access, temporary strutting, edge protection and handrail solutions. Download the Uni-span Scaffolding Catalogue here. Our scaffold products are hot dipped galvanized and manufactured from high tensile steel, enhancing safety standards and extending product life span. 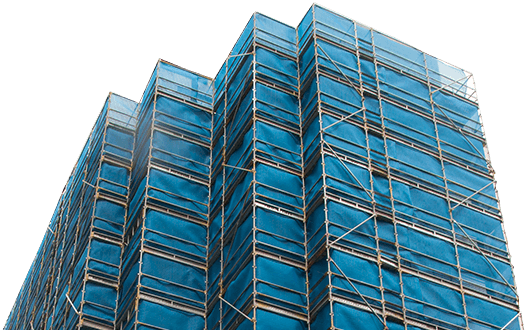 It is rust-resistant, reducing maintenance expenses, and is also much lighter than many other scaffold systems, which means better productivity and lower freight costs. A faster construction programme and healthier profit margin on labour allowance is our aim for our customers. Find out more about our experience in mining, infrastructure projects and commercial industries. Our Industrial supply team has high levels of experience and skill in customising a scaffolding solution to meet your industrial project needs. We understand the stringent Occupational, Health and Safety obligations in this sector and can ensure that our products, systems and procedures meet these. This is confirmed in our accreditations in ISO 9001:2015, OHSAS 18001:2007 and ISO 14001:2015. We provide safe and efficient solutions by employing the right people for the right job. Uni-span supports these teams with engineering resources that yield superior results, establishing benchmarks within the industrial and mining sectors. Recent project experience (North QLD Line Crossing, QCLNG, North QLD MIA) has highlighted our industrial capabilities all the way from the tip of the Northern Territory throughout Australia’s Basins. Stock volumes and labour resources are planned well in advance to accommodate every project stage. Adapting to sudden project scope deviations or changes are clearly communicated, managed efficiently and adjusted within the required time frame. Examples of our labour efficient products and engineered solutions can be seen in our industrial case studies. Safety is always Uni-span’s priority. We understand that workplace health and safety is a pre-eminent concern for our customers. Uni-span is committed to ensuring the health, safety and welfare of its employees and any other people who may be affected by the organisation’s operations. Uni-span’s senior management, including directors, recognise the importance of the health and safety of all its employees and are firmly committed to preventing injury and illness to any of these individuals. Sufficient resources will always be provided in order to achieve this. Through leadership and communication, this commitment to safety establishes injury prevention goals and safe work procedures. Employees and contractors must take reasonable care of themselves and others to co-operate with Uni-span’s commitment and protect their health and safety. Uni-span directors oversee the effectiveness of the group’s Workplace Health and Safety Committee and ensure outcomes and best practices for all initiatives are supported through all levels of the organisation. Establishing measurable objectives and targets ensures continuous improvement toward eliminating work related injury and illness. Risk assessments are carried out on all work sites to control and minimise risks. Safe Work Method Statements identify and control all hazards for all work undertaken. Regular audits detect improvements to be made and allow Uni-span to act on the findings to not only improve procedures, but establish better control to minimise risks and keep our workforce safe. All health and safety processes are documented, implemented, maintained and communicated to all employees and are always readily available. Uni-span will always comply with current WHS legislation, standards and codes of practice. Safety first. Always.